Grow the Difference - Know the Difference! 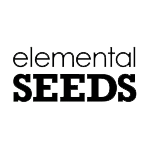 Elemental Seeds is a partnership of renowned breeders, and is home of the multi award-winning strain, The True OG (27.6% THC). The breeders and growers at Elemental Seeds are credited with countless High Times Medical Cannabis Cup wins. Winner High CBD. Elemental Seeds is heating things up in North California with their Cup-Winning genetics & crowd-pleasing new blends.